L'Asie, dressee pour l'etude de la Geographie. 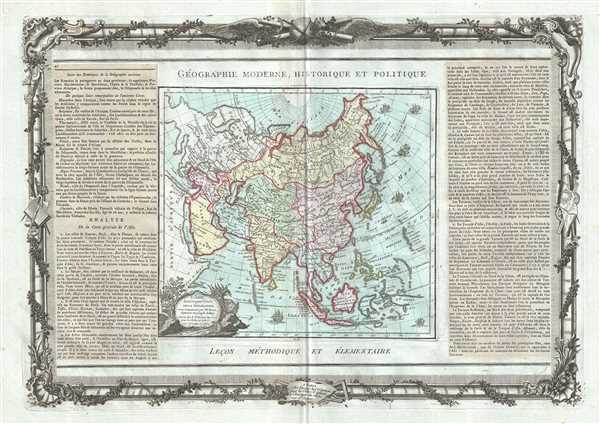 This is an attractive example of French cartographer Louis Brion de la Tour’s 1786 map of Asia. It covers from Africa and the Mediterranean east to Bering Strait and south as far as Java and New Guinea. This map is most interesting in its rendering of the northeast portions of Asia. Just to the east of Yeso (Hokkaido), Brion maps the apocryphal Terre de la Compagnie or Terre de Gama. Often called de Gamma Land or Gama, these islands were supposedly discovered in the 17th century by a mysterious figure known as Jean de Gama. Various subsequent navigators claim to have seen this land, but it was left to Bering to finally debunk the myth. In 1729, he sailed for three days looking for Juan de Gama land but never found it. Though it may be little more than a mis-mapping of Hokkaido or the Japanese Kuriles, Gama or Compagnie remained on maps for about 50 years following Bering's voyages until the explorations of Cook confirmed the Bering findings. Though the mainland of Siberia and northeast Asia are remarkably well mapped based upon the explorations of Vitus Bering and Tschirikow, a further anomaly appears in the form of an unusual landmass just to the east of Kamchatka roughly where the Aleutian Islands are today. A note reads that this land mass claims that it was seen in 1741. This is most likely an embryonic representation of the Muller Peninsula. The Muller Peninsula was a postulated by Gerhard Muller around this time based on recorded sightings of the Aleutian Archipelago and their misinterpretation of it as a single land mass. Further to the south New Guinea (Novelle Guinee) is maps speculatively with most of its eastern and southern borders left blank. Six ships are depicted sailing in the sea. A beautifully engraved title cartouche adorns the bottom left quadrant of the map. To the left and right of the map are paste downs of French text with remarks and description of the map. Surrounding the whole is an elaborate decorative border featuring floral arrangements, surveying tools, elaborate baroque scalloping, and a winged globe. This map was issued as plate no. 41 in the most deluxe edition of Desnos’ 1786 Atlas General Methodique et Elementaire, Pour l’Etude de la Geographie et de l’Histoire Moderne.